В начале 1921 года началась разработка транспортного самолета Vickers Vulcan. Этот биплан с размахом крыла 14,94 м имел вместительный фюзеляж овального сечения, заполнявший по высоте все пространство между крыльями. Пилот сидел в открытой кабине перед верхним ДальшеMore>>> крылом, а в закрытой кабине в фюзеляже могли разместиться от шести до восьми пассажиров. Для снижения стоимости на первых шести самолетах (Type 61) были установлены оставшиеся со времен войны 360-сильные (268 кВт) ПД Rolls-Royce Eagle VIE, но из-за невысоких летных характеристик оставшиеся две машины (Type 74) оснастили 450-сильными (336 кВт) ПД Napier Lion. Один из ранних серийных самолетов был построен в грузовом варианте (Type 63) для испытаний Министерством авиации, но затем снова переделан в пассажирский. Вместе с еще одним самолетом с двигателями Eagle и двумя машинами с двигателями Lion, он использовался компанией «Imperial Airways» на авиалиниях в Европе. Из-за низкой надежности служба самолета Vulcan оказалась недолгой - к середине 1920-х годов на линиях оставалась одна или две уцелевшие машины. Вариант Type 74 имел максимальную взлетную массу 3062 кг и развивал максимальную скорость 180 км/ч. AT the Weybridge works of Messrs. Vickers, Ltd., a new commercial aeroplane is nearing completion; in fact, by the time these notes appear, the first machine of the "Vulcan" class will probably have been put through its preliminary tests by Capt. Cockerell. 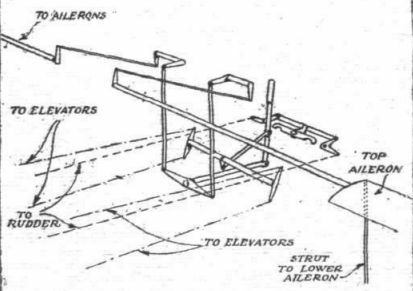 As distinct from recent Vickers land machines of Mr. R. K. Pierson's design, the "Vulcan" is a single-engined biplane, although retaining in other respects many of the features which distinguish Vickers machines. At the time of our visit to the works, the first of the "Vulcans" was not completed, and it has not, therefore, been possible to include in this description photographs of the machine. The scale drawings on p. 254, will, however, give a very good idea of the general lay-out. The first feature which one notices is the unusual depth of the fuselage, which extends right up to and serves as a support for the top plane. One result of this great depth is that in side view the fuselage looks somewhat stumpy, although the streamlining is uncommonly good. The width of the fuselage is not, of course, nearly so great, as will be seen from the plan view, and the resistance of the fuselage, is probably very low. Although of considerable span - 49 ft. - there is only one pair of interplane struts on each side. This reduction in the wing bracing has been made possible by the adoption of a thick section, high-lift wing. The actual section employed is one of the airscrew sections, No. 62, we believe, with flat bottom camber. The space available for spars is, therefore, considerable, and the long bays are further relieved by building up the wings as continuous beams. In the drawing, it will be noticed that the wing roots, both top and bottom, extend some distance out from the fuselage. The reason for this arrangement is that the joint between spar root and inner end of end section spar occurs at the point of contraflexure, where the bending moment is zero, and where, consequently, the fish plates of the joint have to resist shear only. As regards general design, the "Vulcan" is a relatively low-powered weight-carrying commercial machine, in which economy in manufacture and operation have been given precedence over performance. Every endeavour has been made to make the "Vulcan" a truly commercial machine, and if it is not quite so fast as some modern commercial machines, it possesses other features which, in our opinion, more than outweigh the relatively low cruising speed of 90 m.p.h. To begin with, the machine carries eight passengers on one Rolls-Royce engine of 360 h.p., so that the power expenditure is only 45 h.p. per passenger at full power, and a maximum speed of about 105 m.p.h. This should certainly bring the machine within sight of being able to show a profit without the aid of a Government subsidy. Furthermore, the low landing speed (about 40 m.p.h. on estimated figures) should make for safety, and should also enable the machine to get out of quite small fields. It is also possible that for a machine which lands so slowly, a lower insurance premium might be required, all of which are points in favour of the lightly-loaded and relatively slow commercial aeroplane. It has already been mentioned that the cabin has seating accommodation for eight passengers. 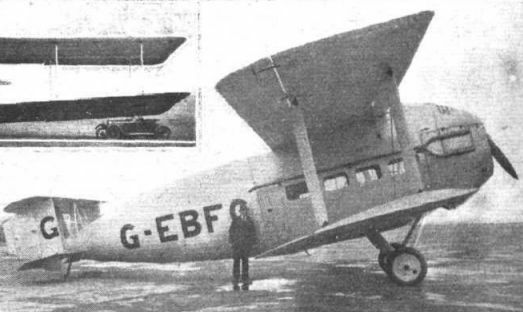 The seats are of a special type designed by Vickers, and when not in use fold up against the sides of the cabin. 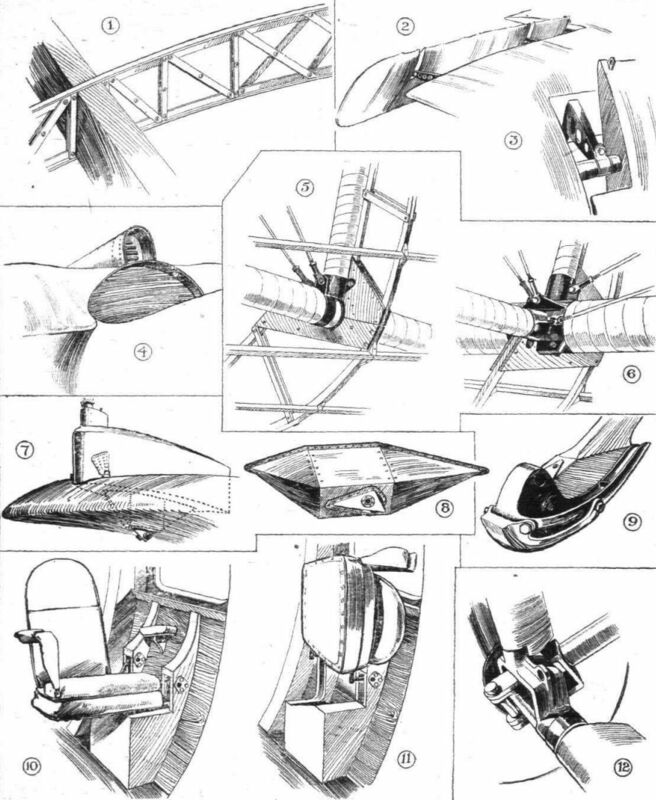 The back rest folds forward on to the seat, and the whole then turns on longitudinal hinges, folding upwards and outwards, as shown in two of our sketches. Should it be desired to use the machine for carrying goods, the seats may be easily removed, each being held in place by two bolts only. A feature of the cabin is the great amount of head-room, about 8 ft. This results from the monocoque construction and the elliptical cross section of the fuselage. In front this head-room is somewhat smaller, owing to the projection of the pilot's cockpit into the front part of the cabin. At the rear a smaller portion is cut off by a locker or luggage space in the roof, but there is still plenty of room for even a tall man to stand upright. In the front wall of the cabin there is a small door on each side, through which the pilot may communicate information to the passengers. Between the two doors is a narrow panel enclosing the two vertical tubes of the aileron control. The top of this panel is left open so that the attachment of the tubes to the cranks is always exposed and easily accessible for adjustment. Incidentally, a passenger who knows something about flying may, by watching theses tubes, get an idea of the amount of use being made of the ailerons. Behind the cabin, and separated from it by a transverse bulkhead, is a compartment divided into two. That on the port side is a diminutive lavatory, while on the starboard side is the luggage compartment. The latter is divided into two "stories," the upper of which is reached from the cabin through a door in the rear wall, and evidently meant for "wanted during the journey" luggage. The lower luggage compartment, which has a portion projecting forward under the double seat on the starboard side, is reached through a door in the starboard side of the fuselage. By the time this issue of FLIGHT is distributed, the first of the "Vulcans" should have been in the air on its preliminary tests. It will then, probably, go to Martlesham for type tests, and should be on the London-Paris service (Instone Air Line) in a couple of weeks. The main characteristics of the "Vulcan" are as follows: Engine, Rolls-Royce "Eagle VIII"; length of machine o.a., 37 ft. 6 ins. ; height o.a., 14 ft. 3 ins. ; span, 49 ft.; chord, 9 ft. 3 ins. ; maximum gap, 8 ft.; area of main planes, 840 sq. ft.; wing loading, 7.3 lbs./sq. ft.; power loading, 17 lbs./h.p. ; weight of machine empty, 3,775 lbs. (pilot, 180 lbs. ); 72 gallons of petrol, 510 lbs. ; 5 gallons of oil, 45 lbs. ; reserve water (2 gallons), 20 lbs. ; W/T, 100 lbs. ; eight passengers at 160 lbs., 1,280 lbs. ; luggage or freight, 240 lbs. ; total loaded weight, 6,150 lbs. Maximum speed near ground (estimated) 105 m.p.h. Cruising speed (estimated) 90 m.p.h. Landing speed (estimated) 40 m.p.h. Climb to 6,000 ft. (estimated) 14 mins. 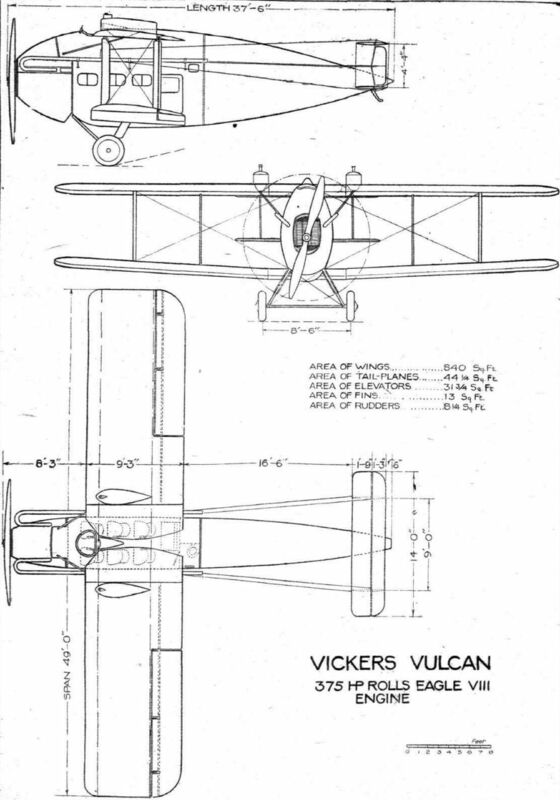 THE VICKERS "VULCAN" COMMERCIAL MACHINE: Three-quarter rear view. A feature of this machine is the exceptionally low landing speed of 40 m.p.h., and the quick pull-up after touching. The "Vulcan" also gets off after a very short run, and climbs steeply. The power expenditure is only 45 h.p. per passenger carried, so that the machine should be very economical. THE VICKERS "VULCAN," 360 H.P. ROLLS-ROYCE "EAGLE" ENGINE. - This machine was described and illustrated in detail in our issue of May 4, 1922, but photographs have not been available until now. The machine carries eight passengers in a roomy cabin, and will shortly be put on the London-Brussels service by the Instone Air Line. THE VICKERS "VULCAN'": One of the 1924 additions to the Imperial Airways fleet. It had a Napier "Lion" and carried seven passengers. 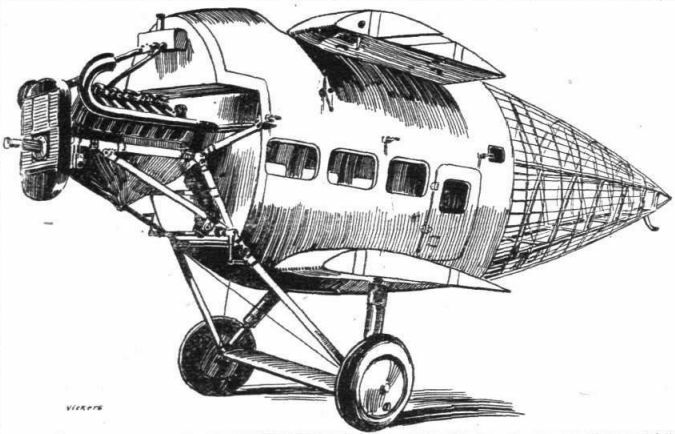 ONE OF TWO "REVIEW" VICKERS MACHINES: The Vickers "Vulcan" commercial aeroplane, with one Napier "Lion" engine. The Vickers "Vulcan," in its latest form, is an eight-seater passenger machine, with Napier "Lion" engine. Самолет G-EBFC - Vickers Type 74 Vulcan, заказанный авиакомпанией "Imperial Airways". THE KING'S CUP: Three interesting machines at Hendon for the start. Left to right, Mr. Alan S. Butler's D.H.37 (275 Rolls-Royce "Falcon 3"), flown by Major H. Hemming; Mr. F. P. Raynham's Martinsyde F.6 (700 Wolseley "Viper"), piloted by himself; Mr. Douglas Vicker's Vickers "Vulcan" (450 Napier "Lion"), flown by Capt. S. Cockerell. The Vickers "Vulcan": Three-quarter front view of fuselage before engine cowl and fabric covering of rear portion are put on. THE VICKERS "VULCAN": Some details of the construction of circular and streamline section struts and longerons. 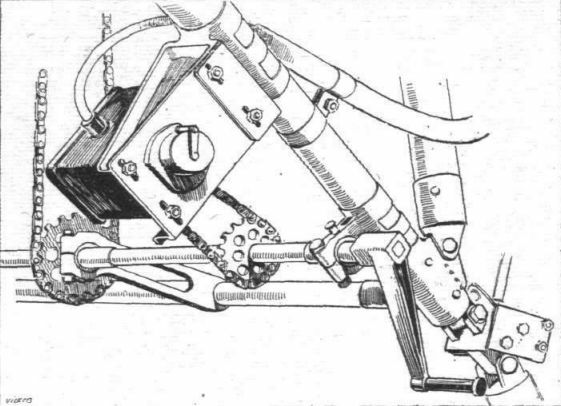 THE VICKERS "VULCAN": Details of the starting gear, showing starting magneto, adjustable eccentric bushes, etc. THE VICKERS "VULCAN": Perspective diagram of the control system. THE VICKERS "VULCAN": Some constructional details. 1. Lattice rib construction. 2. Balanced aileron. 3. Details of aileron mounting. 4. The fairing behind the pilot's head has a tubular stiffening piece to act as a protection in case the machine turns over. Inside the fairing may be seen the ventilator for the cabin. 5. shows details of the manner of building a light structure on to the main fuselage girder in order to turn it into an elliptical section. 6. One of the fuselage longeron clips. (Note the aluminium packing piece which allows of tightening up the fitting in case of shrinkage of the longeron.) 7. One of the petrol tanks mounted on the top plane. 8 is an underneath view of the sump of the petrol tank. 9 shows the detachable steel shoe on the tail skid. 10 and 11 are views of one of the seats, open and folded. 12. Shows the details of the undercarriage where the struts meet the axle. Note how the bending moment has been kept as small as possible by fitting the struts close to the inner end of the wheel hub.